A UC Riverside-led team of astronomers have taken us a step closer to better understand the formation and destruction mechanisms of dust molecules in the distant universe. The space between stars within galaxies is not empty; it is filled with gas and dust. Dust grains are solid particles with sizes smaller than ~ 1 micron (one millionth of a meter) that absorb energetic ultraviolet and optical photons emitted by stars and other energetic phenomena. They then re-emit them at redder (longer) wavelengths in the infrared. Therefore, the absorption and emission of energy by dust particles modifies our view of galaxies. An important component of dust in the interstellar medium is organic carbon-based molecules called polycyclic aromatic hydrocarbon (PAH). These molecules are commonly found on Earth in coal, tar, and the exhaust fumes of car engines. These molecules are also thought to have contributed to the origin of life on Earth. In space, PAHs are the most abundant organic molecules and are found in the interstellar medium, reflection nebulae, supernovae remnants, surrounding young and massive stars, and around evolved carbon-rich stars. PAHs play an important role in the physics and chemistry of the interstellar medium by providing surfaces that allow certain molecules to form, such as H2, carrying the electric charge in the interstellar medium, and efficiently heating the gas in regions where ultraviolet starlight is present. “Despite the ubiquity of PAHs in space, observing them in distant galaxies has been a challenging task,” said Irene Shivaei, a graduate student at UC Riverside, and leader of the study. “A significant part of our knowledge of the properties and amounts of PAHs in other galaxies is limited to the nearby universe.” In the present study astronomers were able to investigate, for the first time, the variations of PAH emissions in distant galaxies with different interstellar medium properties. The study has been conducted as part of a UC-based survey, the MOSDEF survey, which used the MOSFIRE spectrograph on Keck telescope to observe the emitted visible-light spectra of a large and representative sample of galaxies during the peak-era of star formation activity in the universe. The optical spectra have been used to measure the star-formation rate, chemical abundances, and the properties of ionizing radiation in the interstellar medium of distant galaxies. The authors further incorporated the infrared imaging data from the Spitzer Space Telescope and the Herschel Space Observatory to trace the PAH emission in mid-infrared bands and the thermal dust emission in far-infrared wavelengths. The study concluded that the emission of PAH molecules is suppressed in low-mass galaxies, which also have lower fraction of metals (for astronomers ‘metals’ are atoms heavier than hydrogen and helium). These results indicate that the PAH molecules are likely to be destroyed in the hostile environment of low-mass and metal-poor galaxies with intense radiation. The authors also found that the PAH emission is relatively weaker in young galaxies compared to older ones, which might be owing to the fact that the PAH molecules are not produced in large quantities in young galaxies. This study take us a step closer to better understand the formation and destruction mechanisms of dust molecules in the distant universe. The research, which is now published in The Astrophysical Journal, has important implications for the studies of distant galaxies. It shows that the star-formation activity and infrared luminosity per unit of volume in the universe 10 billion years ago is approximately 30% higher than previously measured. The imminent launch of the James Webb Space Telescope in 2018 will push the boundaries of our knowledge on dust and PAHs in the early universe. 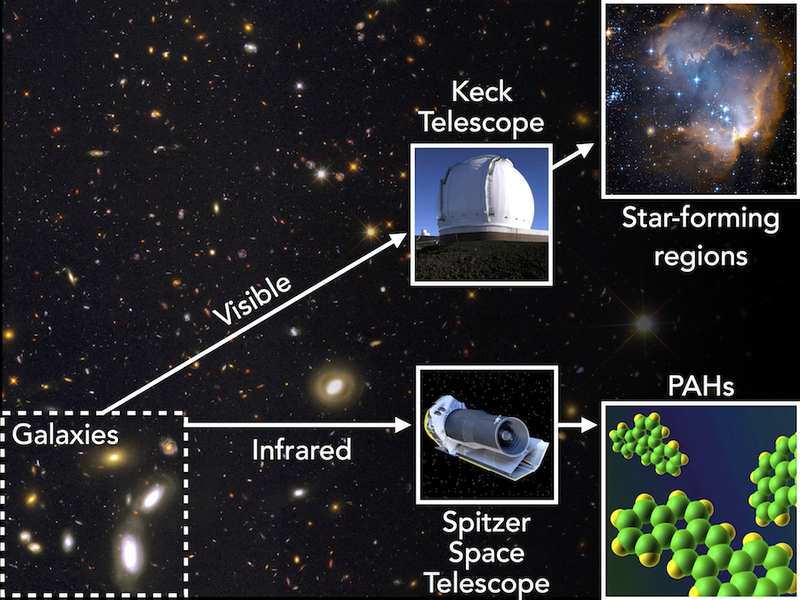 Studying the properties of the PAH mid-infrared emission bands in distant universe is of fundamental importance to improving our understanding of the evolution of dust and chemical enrichment in galaxies throughout cosmic time. The study was published in The Astrophysical Journal. The research team is comprised of Irene Shivaei and Naveen Reddy (UC Riverside), Alice Shapley (UCLA), Brian Siana (UC Riverside), Mariska Kriek (UC Berkeley), Bahram Mobasher (UC Riverside), Alison L. Coil (UCSD), William R. Freeman (UC Riverside), Ryan L. Sanders (UCLA), Sedona H. Price (UC Berkeley), Mojegan Azadi (UCSD), and Tom Zick(UC Berkeley). Figure: In this study, astronomers used data from the Keck and Spitzer telescopes to trace the star forming and dusty regions of galaxies at about 10 billion years ago. The picture in the background shows the GOODS field, one of the five regions in the sky that was observed for this study. Credit: Mario De Leo-Winkler and Irene Shivaei with images from the Spitzer Space Telescope, NASA, ESA and the Hubble Heritage Team.